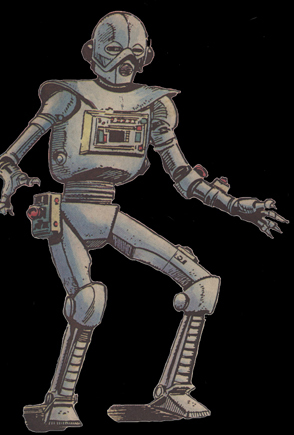 Such is the size of Droid's Superiority Complex Circuits,I mean his star status,that I had to give him his own page! 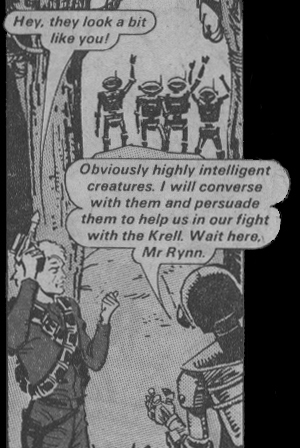 As everybody in the Galaxy knows,even the dreaded Krell,I am really the brains of the outfit(Poor Starhawk! ).And to prove it,I was given my very own Profile in Issue 40 and was asked to present a 2 page special on other(obviously inferior)robots for Issue 50.Please click on the thumbnails below to view the full size images and marvel at how intellectually superior I really am...you have been warned!